Runn Records (formerly RUNNetherlands) established its name in the second half of the 1990s with the release of albums from Mikey Spice, Prezident Brown, ET Webster, Sizzla and most notably Daweh Congo. Besides that the label was trendsetter with their releases of official Continuous Mix CDs like “Heathen Chant”, “Drum Song” and “X-Rated Gang Vols 2 & 3”. Now, some five years after their last release – “Ras Fire & Mad Professor: Hold On 2 Dub” – the label returns with two digitally released singles for a brand new backdrop called “Topic Riddim”. The “Topic Riddim” was composed & arranged by Aart Timmermans aka Ras Fire and laid by Erik Ritfeld (piano, keyboard), Bunn Riley (bass), Freddy Poncin (drums) and – former lead singer of successful Dutch reggae band Beef – Bram Wouters aka Irieginal Abraham (rhythm guitar). It was recorded at Runn legacy/Hall 5 Amsterdam by Frank de Jong, while the final mix was done by Barry O’Hare at World-A-Muzik Studio in Ocho Rios, Jamaica. The vocal piece titled “Riddim & Sound” features the voice of Natty Campbell, a dynamic young MC and singjay from Brixton, London UK. Having built his way up in the local sound system scene and working with various bands, Natty Campbell became a member of Reggae Roast (one of the key players in the new wave of UK Reggae) in late 2016. Since then he has appeared at major festivals in the UK and abroad. Recordings of this upcoming artist are featured on releases from Trojan Records new label Trojan Reloaded and on Chase & Status’ “RTRN II JNGLE” album. 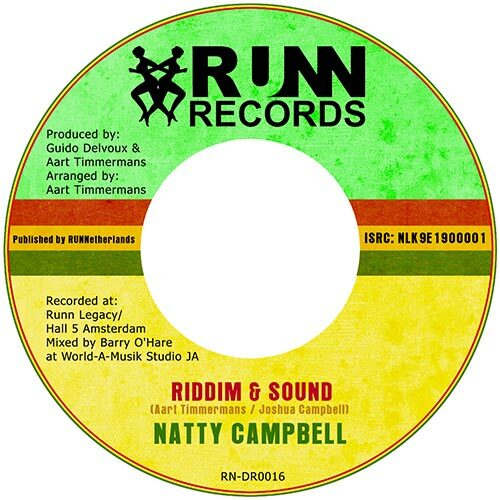 With “Riddim & Sound”, Natty Campbell delivers a real nice tailor-made roots tune for play on a custom-built Sound System. Anyone who wants to enjoy the riddim to the fullest can check Ras Fire’s “Topic Dub”.